If you had to list the top premium Android phones on the market today, the OnePlus 5 and GooglePixel XL would definitely be in the top 10. The recently released OnePlus 5 gives fans much to be excited about. For its part, the Pixel XL has been considered the apex Android phone since its release in 2016. 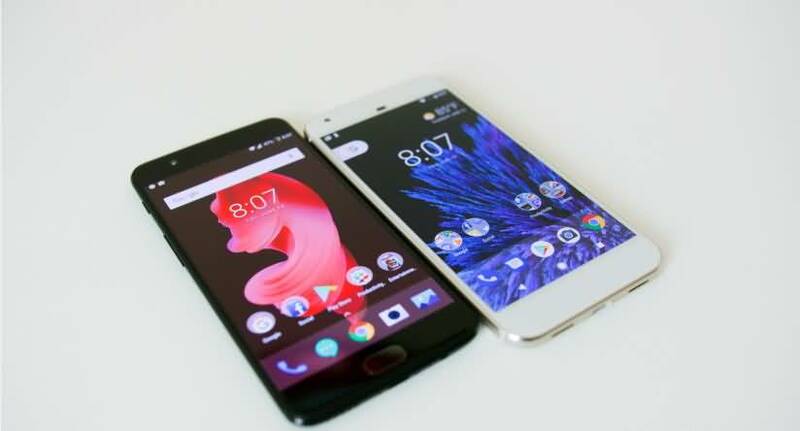 Both phones have upped the ante and earned their place at the cutting edge of Android smartphones. Let’s see how they stack up against each other. The OnePlus 5 and Pixel XL are both beautifully minimalist in design. They have clean outlines with rounded corners and barely noticeable side buttons. They’re also very sleek and easy to handle. That said, the OnePlus 5 does have a design edge over the Pixel XL. To start with, the OnePlus 5 is noticeably thinner than the Pixel XL. It is 7.25mm thick while the Pixel XL is 8.5mm thick. This gives it a much sleeker feel. Also, the OnePlus 5 is designed with the functional design features users expect. Its front side has a 5.5 AMOLED screen and capacitive home button with embedded fingerprint sensor. The Pixel XL however, has a blank space under the screen where you’d expect a home button or fingerprint sensor to be. Many users find the home button very useful. So, the Pixel XL loses points for not having one. It’s also unclear that there’s any advantage to having its fingerprint sensor at the back rather than in front. On the back of the OnePlus 5, you’ll find its powerful dual cameras on the top left side along with its flashlight. Its centered OnePlus logo is also slightly to the top on the back. This leaves a good deal of blank space and it makes the OnePlus 5 look a bit plain when viewed from behind. On the other hand, the Pixel XL is famous for its two-tone back cover which combines glass and metal. The glass upper side is where its 12.3MP camera, speakers and fingerprint sensor are placed. While giving the Pixel XL points for its nice cover design, it’s clear that the OnePlus 5 wins out on overall design. Both phones are very impressive on specs and they each have their strengths. However, with its more powerful processor and larger storage capacity, the OnePlus 5 extends its lead over the GooglePixel XL. The OnePlus 5 comes with the latest Qualcomm Snapdragon processor. Its Snapdragon 835 is more powerful and energy efficient than the Pixel XL’s Snapdragon 821. This means that while both phones perform exceptionally well at handling multiple active apps and fast-action mobile games, the OnePlus 5 performs relatively better and with enhanced responsiveness. The OnePlus 5 also has larger baseline RAM and storage which gives it more room to run apps simultaneously. It comes standard with 6GB of RAM and 64GB of storage. For its part, the Pixel XL comes with a standard 4GB RAM and 34GB baseline storage. Both phones have 5.5inch AMOLED screens with 4K HDR ability. However, the Pixel XL has better screen resolution. It has a QHD 2560 x 1440px screen compared to the Full HD 1920 x 1080px screen of the OnePlus 5. This makes the Pixel XL relatively better at processing and rendering images. That said, many users have observed that the Pixel XL’s screen doesn’t perform very well in certain outdoor conditions. It’s been observed to get too dim in direct sunlight. This can make it problematic to use the Pixel XL’s camera or access apps while outdoors on a sunny afternoon. With pluses and minuses recorded on both sides, it’s fair to say these phones are tied on points with respect to their screens. When it comes to camera performance, the Pixel XL scores a clear win over the OnePlus 5. Until recently, it had the best smartphone camera with a DxOMark Mobile score of 89. Its top-performing 12.3MP rear camera shoots in HDR by default and is noted for taking excellent shots in various conditions. The Pixel XL also stabilizes videos and photos using its Gyroscope and patented software. This makes it easier to take jitter-free photos and videos no matter the conditions. While its rear cameras do not perform as well as the Pixel XL’s, the OnePlus 5 is by no means a slacker. It has a powerful pair of 16MP and 20MP rear cameras. Its 20MP rear camera is a telephoto lens which makes it easy to take dreamy bokeh photos. The OnePlus 5 and Pixel XL both have powerful batteries and quick charging features. The Pixel XL has a 3450mAh battery compared to the smaller 3300mAh battery of the OnePlus 5. However, the OnePlus 5 has been shown to have better battery life and a better fast-charging feature. The OnePlus 5 also does much better with power usage because it has a more energy efficient processor chip and a less demanding 1920 x 1080px resolution screen. The OnePlus 5 and Pixel XL both run on Android. The Pixel XL does have a more recent version of Android Nougat. It runs the Nougat 7.1.2 OS while the OnePlus 5 runs on Nougat 7.1.1. The Pixel XL is also set to be one of the first phones to receive recent Android updates. This gives it an edge since users can trust that its software will be updated at no cost for the foreseeable future. For its part, the OnePlus 5 has a proprietary OS known as OxygenOS. It’s built on Android Nougat 7.1.1. Much will depend on how often OxygenOS is updated and how long OnePlus phones will be allowed to receive free OS updates. On the whole, both phones show the android OS at its best. Their interfaces are clean, intuitive and easy to navigate. They also have great voice activation features with seamless access to Google Assistant and other standard Google services like Maps and Search. The OnePlus 5 is clearly the winner when it comes to price. While it’s the most expensive smartphone ever made by OnePlus, it’s still significantly more affordable than the Pixel XL. Its 6GB RAM + 64GB storage version retails for $480. The baseline Pixel XL with 4GB RAM + 32GB storage version retails for $649. The Pixel XL is currently more widely available than the OnePlus 5. It’s also compatible with most mobile networks. That includes GSM, HSPA, LTE and CDMA networks. The OnePlus 5 was only recently released and is available in limited stocks. It’s also important to note that the OnePlus 5 is not compatible with CDMA networks. These smartphones compare very well against each other. They also share some weaknesses. The OnePlus 5 and Pixel XL are not water resistant, but Pixel XL is splash and dust resistant. This puts them behind flagship Samsung, Sony and HTC phones. Also, both phones do not have SD Card slots, which means their storage capacity cannot be extended. Finally, they are not equipped for wireless charging. Both phones do have nice UI features that improve usability and customer experience. The Pixel XL’s app shortcut is a good example. It brings a popular iPhone feature to Android and gives users access to an extra menu when they long press an app. The shelf for frequently used apps is a great UI feature that’s available on the OnePlus 5. It also improves usability and though active by default, it can be customized or disabled. All in all, the OnePlus 5 stands out for its state-of-the-art specs and relatively affordable price. OnePlus 5 vs LG G6: Which is best?